“Thin organic layers provide machines and equipment with new functions. They enable, for example, tiny energy recuperators. In future, these will be installed on pipes or other surfaces in order to convert waste heat into electricity. 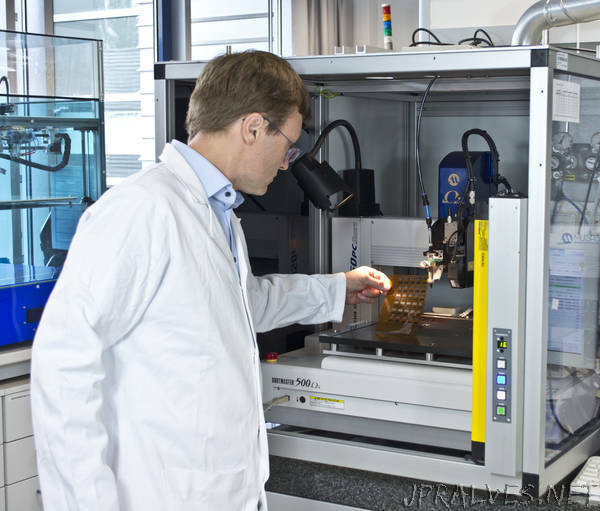 The experts at the Fraunhofer Institute for Material and Beam Technology IWS Dresden use ink based on conductive polymers for this purpose. The IWS engineers have developed a new process for this project: Small molecules are synthesized into polymers which are able to transport negative charge carriers (electrons). The “trick” is that this polymer, unlike comparable polymers, is in a liquid state. This polymer enables the scientists to print or spray very thin and smooth organic functional coatings on surfaces. “We want to construct thermoelectric generators that, for example, supply energy to sensors in places that are difficult to access, where battery replacement is not useful, not possible or very expensive,” reports Lukas Stepien, who, together with Dr. Roman Tkachov, manages this development project at Fraunhofer IWS Dresden. Warm pipes that do not get hotter than 100 degrees Celsius - this is the upper limit for the polymers investigated so far. “Additionally, this technology might also benefit the ‘Internet of Things’: sensors and other electronic components using thermoelectric generators could cover their own electrical energy requirements. An external power supply will be no longer necessary,” adds Lukas Stepien. “Thermoelectric generators” have been known as concept for years. However, their efficiency is still far too low for large-scale use: on average, they convert only six percent of the heat energy received into electricity. “The fact that this technology has not yet been able to establish itself might probably be also due to the industry’s excessively high expectations,” reports Lukas Stepien. “Today’s polymer-based thermoelectric generators, unfortunately, usually deliver only a few milliwatts.